DigitEMB is the best place of making machine embroidery designs. Machine embroidery designs are those designs which can be stitched by the machine to provide best quality and perfect designs to our customers. 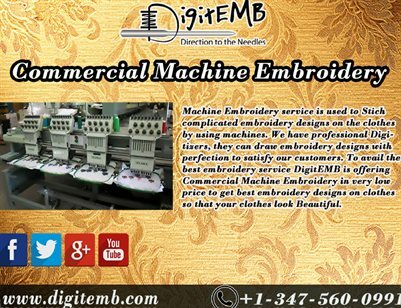 DigitEMB is providing service of Commercial Embroidery Machine for everyone in affordable price. We have the best Designers who work very hard to satisfy our customers.